Transparency Market Research has published a new market research report titled ‘Candle Market (Type:Tea Lights, Votive, Pillars, Birthday Candles, Cartridge Candles, Wax Filled Container Candles, and Others; Raw Material: Beeswax, Stearin, Paraffin Wax, Rapeseed Wax, Palm Wax, Soy Wax, and Others) - Global Industry Analysis, Size, Share, Growth, Trends, and Forecast, 2018– 2026.’ According to the report, the global candle market is anticipated to reach US$ 13,619.3 Mn by 2026. The market is expected to expand at a CAGR of 6.0% from 2018 to 2026. Based on type, the candle market has been classified into tea lights, votive, pillars, birthday candles, cartridge candles, wax filled container candles, and others. Tea lights, votive, and wax filled container candles are expected to expand at a faster rate in the near future. Increase in usage of candles at special occasions, events, festivals etc. is anticipated to boost demand for candles. 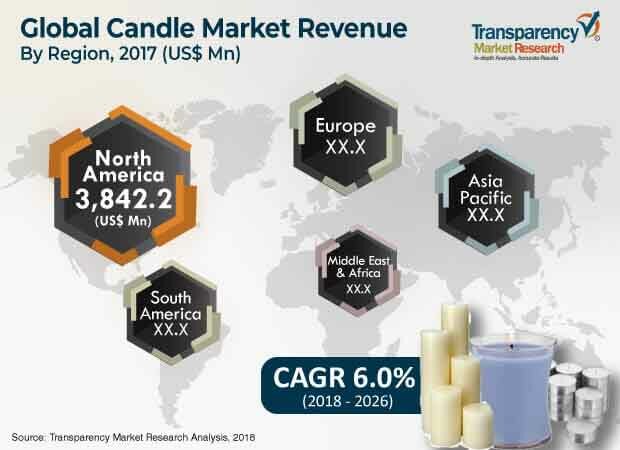 In addition, rise in popularity of scented candles and decorative candles and new areas of application for candles are key factors expected to fuel the growth of the candle market during the forecast period. In terms of raw material, the candle market has been divided into beeswax, stearin, paraffin wax, rapeseed wax, palm wax, soy wax, and others. Paraffin wax is the most common raw material used in the production of candles. It is a by-product of petroleum and very economical in nature. Apart from paraffin wax, stearin is also frequently used by candle manufacturers across the world. In developed economies, there is a rise in demand for beeswax as it is organic in nature and improves air quality. Earlier, candles were a functional product and only to be used as a source of light. These days, candles are not just a functional product, but a decorative product. Appearance and fragrance are the two important factors which consumers demand. Different shapes are introduced to cater to the customized demands of clients.Scent infused candles are mostly preferred due to their added characteristic to lighten the mood. Aromatherapy treatment also employs scented candles which help to release stress. The market for aromatherapy has grown rapidly, which has increased the consumption of aromatic candles.Aromatic candles aid in managing mental and physical stress and tension. Based on geography, the candle market has been segmented into North America, Europe, Asia Pacific, Middle East & Africa, and South America. Europe is a dominant region of the candle market. The market in the region is projected to expand at a gradual CAGR of 6.0% in terms of value. The market in North America is expected to expand at a considerable CAGR of 5.9%, due to increase in consumption of eco-friendly candles in the region. According to the report, the candle market in Asia Pacific is projected to expand at a CAGR of 6.2% in terms of revenue in the near future. The market in South America is likely to expand at a CAGR of 5.8%. The market in Middle East & Africa is anticipated to expand at a CAGR of 5.7% in terms of value. Some of the prominent players operating in the global candle market include Vollmar GmbH, Baltic Candles Ltd, Bolsius International BV, Delsbo Candle AB, Duni AB, Hansa Candle AS, KORONA Candles S.A., Ceras Roura, Contract Candles Ltd, and Candle Scandinavia Group AB. These players are estimated to face healthy competition in the near future due to presence of a large number of local players in the market. Major brands are likely to focus on research & development to strengthen their foothold in the global candle market. Companies are undertaking mergers and acquisitions, and joint ventures with local players to expand their product portfolio. Producers in developing countries are focusing on reducing their cost of production and increase profitability for the sustainable growth of their business.